Self-Adhesive Cable Clamps allow you to easily mount cable bundles to any surface! Cable Clamps make wiring and cable installations clean and well organized. These cable clamps allow you to easily mount cable bundles to the wall, ceiling or any surface desired. These cable clamps have a self adhesive pad on the back that makes tooless installation a breeze. 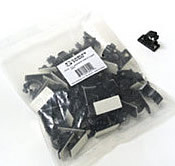 50 self adhesive cable clamps per package.